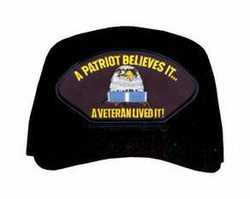 This A Patriot Belives It ... A Veteran Lived It (Korea) ball cap is five panel, emblematic, poly, dark under the visor, full back (not mesh) and fully adjustable. All of our military hats are guaranteed against manufacturer defects. These are the same ball caps found throughout the Military. These Army caps make a wonderful addition to your collection or a great gift for that special someone! Our ball caps are MADE IN AMERICA.